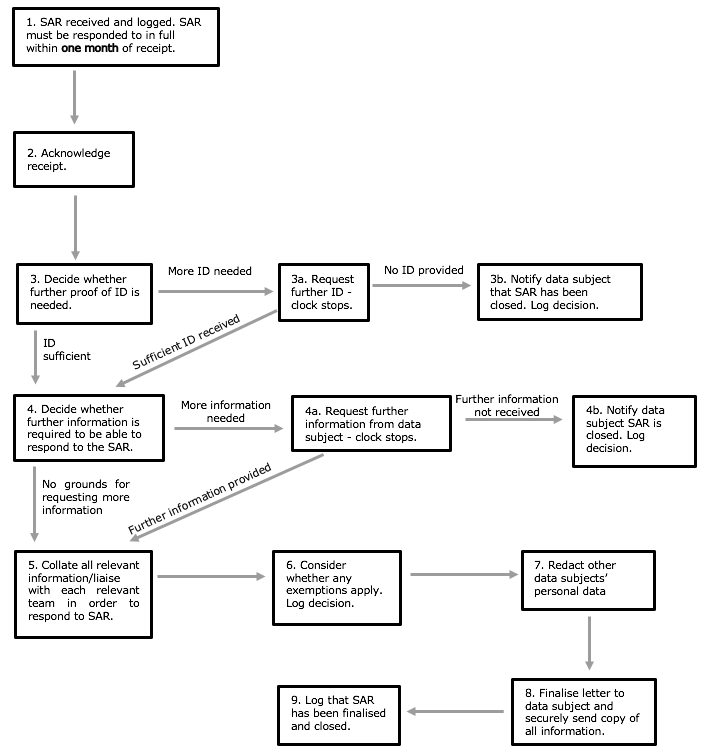 The flow chart below sets out the steps that will be followed each time a subject access request is received by Mobivate. Further commentary in respect of each of those steps is set out below the flow chart. Note: at the date of receipt, Mobivate has one month within which to respond to the subject access request. Mobivate is not entitled to and will not charge for responding to a subject access request, although see further comments at Step 6. Mobivate will maintain a log of subject access requests it receives, setting out the dates on which the requests are received, and the final response sent, together with any intermediary steps taken before sending a final response (for example, request for identification proof or further information in respect of the data). If Mobivate fails to respond to the request in accordance with GDPR timescales, this will be noted together with an explanation of the failure and steps taken to avoid such failure in the future. Mobivate will acknowledge receipt of the subject access request (although this is not strictly necessary). Mobivate will only respond to a subject access request if it is confident of the identity of the applicant. Mobivate will be reasonable in terms of what it asks for and will not ask for a significant amount of extra information if the identity of the person making the request is obvious to Mobivate, which is more likely to be the case if Mobivate has an ongoing relationship with that person. If, for example, an existing employee makes the request it’s likely Mobivate will be able to confirm their identity easily (the ICO wouldn’t react well to an attempt to delay the process by asking for further proof of identity). If, however, Mobivate receives a request from a customer it has not previously dealt with or the customer’s email address / postal address has changed since its last dealings with them, it may seek further proof of identity such as a recent utility bill or copy of driving licence or passport. In this scenario, the one month time period to respond will commence only once Mobivate has received the proof of identity. Thereafter, Mobivate will not delay in asking for further proof. Mobivate is entitled to ask for further information it reasonably needs in order to comply with the request, although it will not delay responding to a subject access request unless it requires more information to find the data in question. Mobivate will not require the applicant to narrow the scope of the request (they are entitled to ask for all the information we hold), but Mobivate may ask them to provide some context around the information they’re seeking such as relevant dates or if they want a particular document or type of document (for example, letter, email, application form), which may help Mobivate locate the data). Mobivate will not delay in asking for further information and will be clear about what details it needs. Provided Mobivate does that, and needs the additional information in order to be able to comply (rather than it being a tactic to delay timescales), the one month time period will begin when it receives the information. Collating all relevant information will be the most time consuming task. Consideration will be given to which departments may hold personal data and whether that personal data can be accessed centrally by (for example) the legal or IT team. Consideration as to how to search for the data will be given. For example, does the data subject use a username or alternative name which would also need to be searched? These are relatively narrow in scope but Mobivate will bear them in mind when responding to a subject access request. If a request is manifestly unfounded or excessive, Mobivate may charge a reasonable fee or refuse to act on the request, but Mobivate will have to demonstrate that the request is unfounded or excessive. If Mobivate processes large volumes of data about the individual making the request, it is entitled to ask the data subject to specify the information or processing activities to which the request relates (as referred to above). If personal data relating to other individuals is included in the documents that will be provided pursuant to the subject access request, it will need to be redacted. Mobivate could alternatively obtain consent from the data subject to disclose the personal data, but that could be more time consuming than redaction. communication of the personal data undergoing processing and any information about its origin. If the above information is requested in the subject access request, it will be provided. See comments at Step 1 for information that will be recorded. Mobivate shall keep a copy of the information provided until it has confirmation from the data subject that it does not require any further information or for a period of 6 months from completion of the request, whichever happens first.